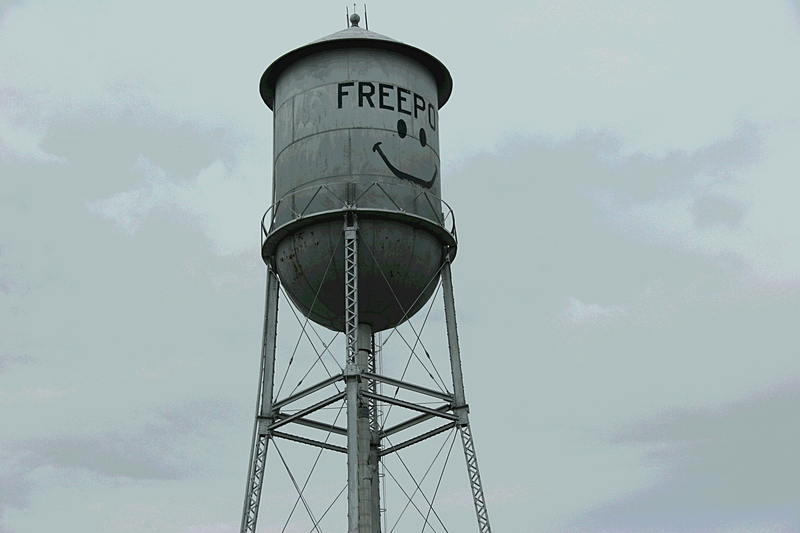 Freeport promotes itself as "The city with a smile!" 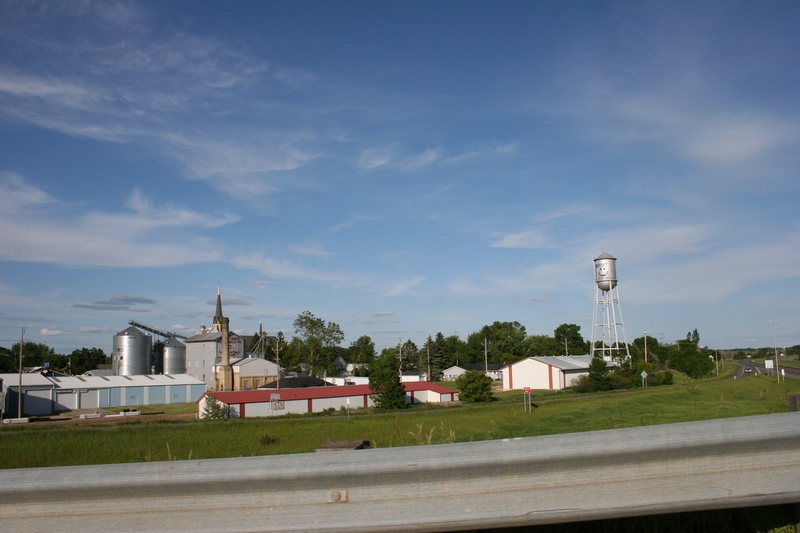 That's the smiling water tower to the right and the Swany White Flour Mill to the left in front of the church steeple in this June 2011 image. Freeport is among the communities after which Garrison Keillor's fictional Lake Wobegon is fashioned. CROSSING THE OVERPASS into Freeport last June, I snapped a quick landscape photo with the town’s charming water tower smiling at travelers along Interstate 94 in central Minnesota. I should have focused, though, on the old-fashioned grain elevator-style flour mill to the left in my framed image. Late Tuesday afternoon this historic icon, the Swany White Four Mill, built in 1897 and owned by the Thelen family since 1903, burned. Minnesota has lost an important part of her history, a still-functioning mill of yesteryear that specialized in producing commercial grade and organic flour and was known for its famous Swany White Buttercake Pancake and Waffle Mix. That I never realized the importance of this towering, aged building on that June afternoon saddens me for I am typically drawn to small-town elevators. 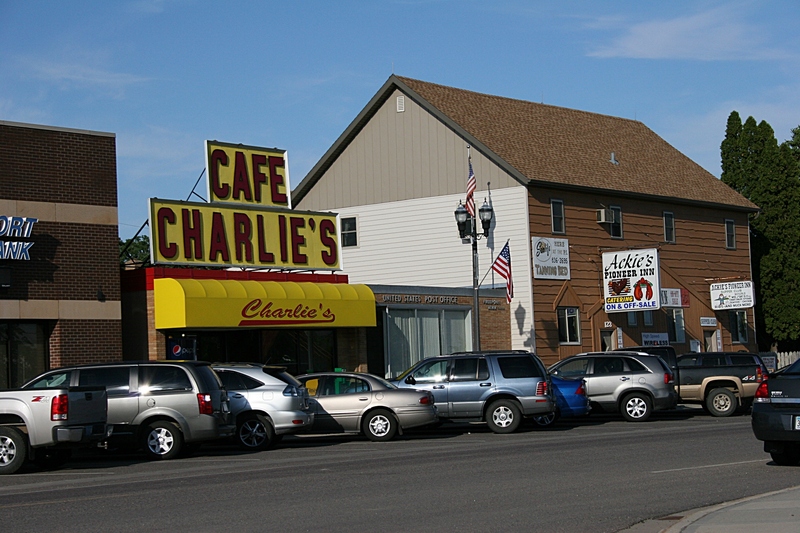 But when my husband and I swung into Freeport late on that Saturday afternoon 6 ½ months ago, we were more interested in finding Charlie’s Café, a popular dining spot in this town of 450. We were hungry. Charlie’s was packed, so we left town without eating there, but not until I snapped photos of the café and Sacred Heart Church and School. Popular Charlie's Cafe is noted for its tasty homemade food including caramel rolls, meringue pies and hot beef commercials. To the right is the Pioneer Inn, after which Garrison Keillor modeled The Sidetrack Tap in his fictional Lake Wobegon. Keillor and his family lived near Freeport in the early 1970s. 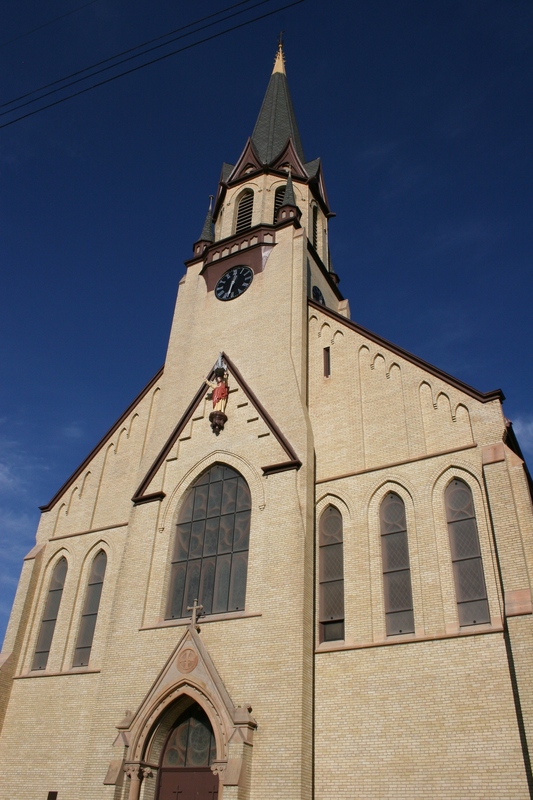 Sacred Heart Church, Freeport, described by Garrison Keillor as "a fine tall yellow-brick edifice with a high steep roof." 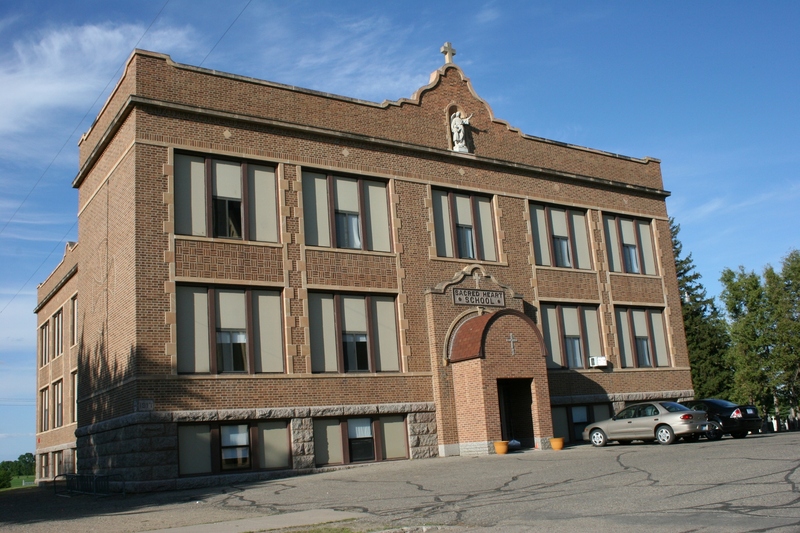 Sacred Heart School in Freeport, a lovely old building that caught my eye. I totally missed out on the Swany White Flour Mill, simply because I was unaware of its important existence. Eleven years ago, though, the historic mill, Charlie’s and other central Minnesota scenes were photographed by National Geographic photographer Richard Olsenius, illustrating a story, “In Search of Lake Wobegon,” by Garrison Keillor, expanded in 2001 as a book. A sister-in-law gave me her copy of the December 2000 National Geographic recently, knowing how much I would appreciate Keillor’s writing and the black-and-white images by Olsenius. I do. Keillor rented a farmhouse south of Freeport some 40 years ago. He and his family weren’t exactly embraced by the community during the three years they lived there. Keillor writes about his experiences in the magazine piece, where he reveals that his fictional Lake Wobegon is based on life in central Minnesota, including Freeport. It hasn’t exactly been a quiet week in Lake Wobegon.